Eighth Edition: new memorials, museums, routes. Almost 100 memorials are shown plus some 150 war cemeteries, 35 bunkers, 12 demarcation stones and 8 water filled craters. Their postions are indicated by colour coded lollipops - war cemeteries , memorials , bunkers , Albertina memorials , demarcation stones , museums and the burial places of literary figures or personalities buried in the Salient are marked on the map using the colour code shown here. The shape of the battlefield is readily seen as ground above 50m is shaded making the Passchendaele and Messines ridges stand out, as do Mont Kemmel and Mont Noir, the Flanders hills that lead back towards Mont des Cats and Cassel. 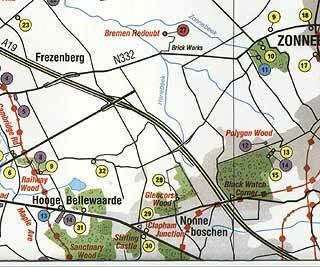 A further help to understanding the progress of the battles is that the significant woods are clearly marked in green. Modern roads and motorways are shown so that the map can be used for navigation as well as for support in reading about the battles while 1914/18 place names are shown in red. Overlaid on the map is a grid reference system which allows all of the information to be readily accessed. 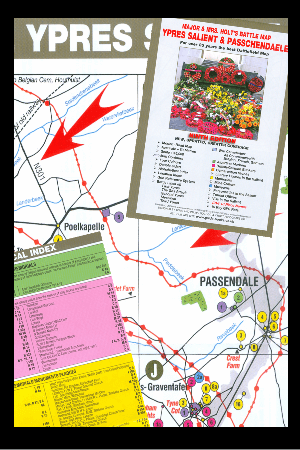 These references are used in the indexes (see below) and although the map can be purchased by itself and used on its own, the grid references are also co-ordinated with the stops recommended in Major and Mrs Holts Battlefield Guide to the Ypres Salient. The map is actually wrapped with the book. There are two types of index. 1. Location. Thus upon seeing a marker on the map at grid R27 the index reveals that it is Mud Corner CWGC Cem. 2. Thematic. If wanting to find where 2nd Lt George Llewellyn Davies is buried , who was Barrie’s model for Peter Pan, the Literary Figures index shows it to be at M7, Voormezeele Encl No 3 CWGC. THIS IS JUST A VERY SMALL SECTION OF THE MAP.